A highlight for budding music and vocal students is the annual KZN Young Performers Concert with the KZN Philharmonic Orchestra which takes place on May 12, 2018, at the Playhouse. For the past decade, the KZN Philharmonic Orchestra in association with the South African Society of Music Teachers once more presents its annual very special once-off concert to showcase the solo skills of some of the region’s most promising young orchestral performers and vocalists in a variety concert-type format performing an eclectic repertoire of classical highlights, opera arias, and even crossover opera/pop. The concert features the sublime KZN Philharmonic Orchestra under the baton of Naum Rousine. It is a red letter day for many of the orchestra players, who have the opportunity of performing publicly with their music students. The KZN Philharmonic, in association with the South African Society of Music Teachers, held open auditions to talent-scout for young soloists, facilitated by a judging panel of respected musical professionals. 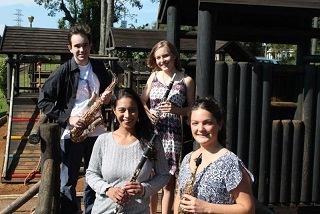 Music teacher, co-principal clarinet and bass clarinettist with the KZN Philharmonic, Kirsten Sayers, is proud of three of her pupils who have successfully auditioned and are eagerly preparing for the concert. “My studio has been buzzing with excitement since the audition for the Young Performers Concert. With much happiness, the youngsters have taken to the task at hand and have diligently applied themselves in their practice. We work as a team and most of the kids from my studio will be at the concert to show their support to our three little stars. As a teacher, I feel it is important to encourage my pupils to get involved in such opportunities. However, as a performing musician, I feel it my responsibility to ensure that they perform from a solid musical foundation. “Just playing an instrument is one thing, but playing the music is totally different. With the latter, the instrument is more like a vessel from which the music comes and the musician and instrument are one. For me and my pupils, this is the ultimate goal of our musical adventure,” she adds. The KZN Young Performers Concert takes place in the Playhouse Drama on May 12, 2018, at 19h00. Tickets available through Computicket / www.computicket.com / 0861 915 8000 / Shoprite Checkers Money Market Counters. Many of the young performers will also be playing in fourth Michaelhouse Festival of Music – an eclectic feast of multi-genre music including an astonishing line up of classical music in different forms, taking place at Michaelhouse School from May 11 to 13, 2018. For more info visit the festival’s Facebook page or William Silk on musicfestival@michaelhouse.org. For ticket pricing and tickets visit www.tickethut.co.za and search for Michaelhouse. The KZN Philharmonic presents its World Symphony Winter Season weekly from June 7 to 28, 2018, every Thursday evening in the Playhouse Opera. Tickets from Computicket. For more information click on the KZNPO advert at the top of this page.